A few weeks ago, the weather was set fair so we took off to Anglesey for a bike ride and a night in our tent. I love these 24 hour mini-holidays. Not driving too far and getting fresh sea air is a tonic and I really enjoy exploring places new to us. I had a new tiny palm sized sketchbook to make a start in. The best sketchbooks are the full ones so I got stuck in. There’s a church tower rising over the dense trees opposite the entrance to the campsite. It’s dedicated to an early Celtic female saint – Saint Ceinwen. Apparently there’s a holy well somewhere in the area – finding where that’s hidden will be a destination for another day! Thanks for the subject of this next sketch Aunty J! The following morning, we cycled out to the Cefni Reservoir from Newborough Sands. Most of the route is off the main road, alongside waterways full of wildlife. I love this time of year. We went on this trip just before Midsummer when growth is at its peak. Have to grab and treasure these days when we can. 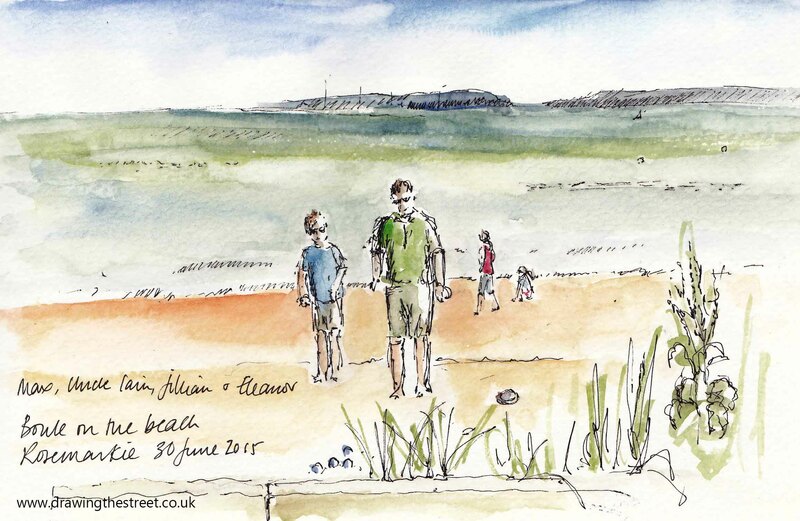 Only a few days after sketching my broken down car on the hardshoulder of the M6, I was sketching on the grass verge of Rosemarkie beach. 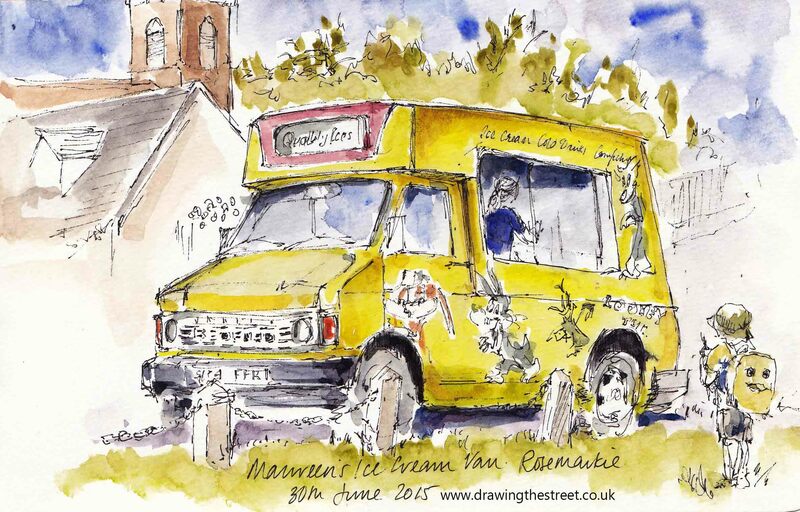 Once again, I began to sketch a vehicle but this time it was Maureen’s ice cream van which caught my eye. I was lost in drawing so it took me by surprise when Maureen herself hopped out of her van to present me with an ice cream! 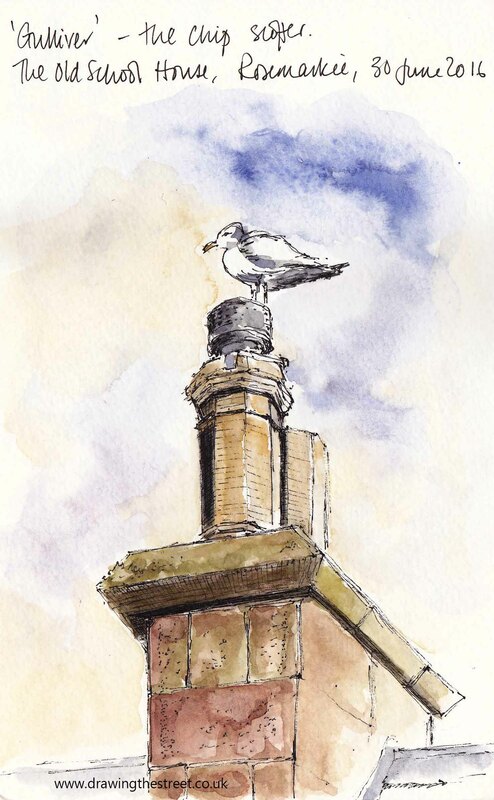 Following this kind gesture, my family were keen for me to sketch other eateries in Rosemarkie in the hope of free snacks for them too, but there is stiff competition from the local gulls. 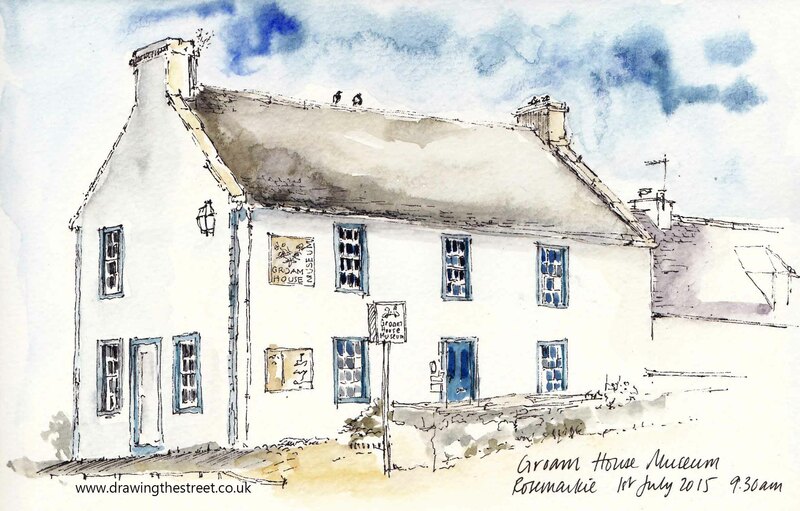 This is our sixth visit to Rosemarkie, a seaside village on the Black Isle, about 30 miles east of Inverness, full of lovely traditional buildings such as the Groam House Museum. For anyone interested in Celtic design, a collection of the work by George Bain is held here. He published the book ‘Celtic Art: The Methods of Construction’ in 1951, which did much to revive interest in the subject. 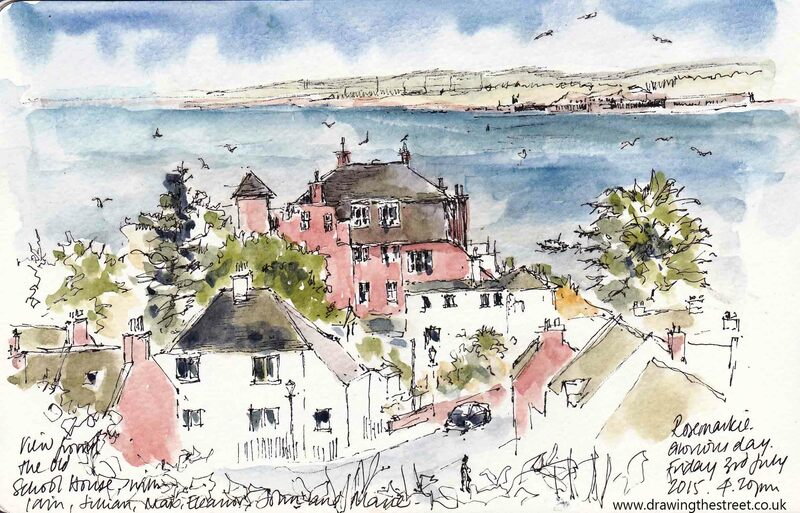 I will leave you with a sketch of the view from the Old School House. 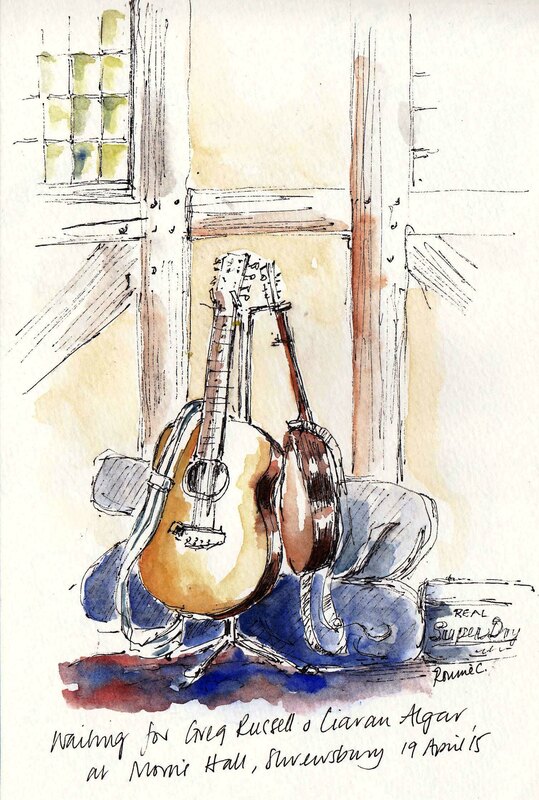 Thanks for reading and keep on sketching – wherever you are. 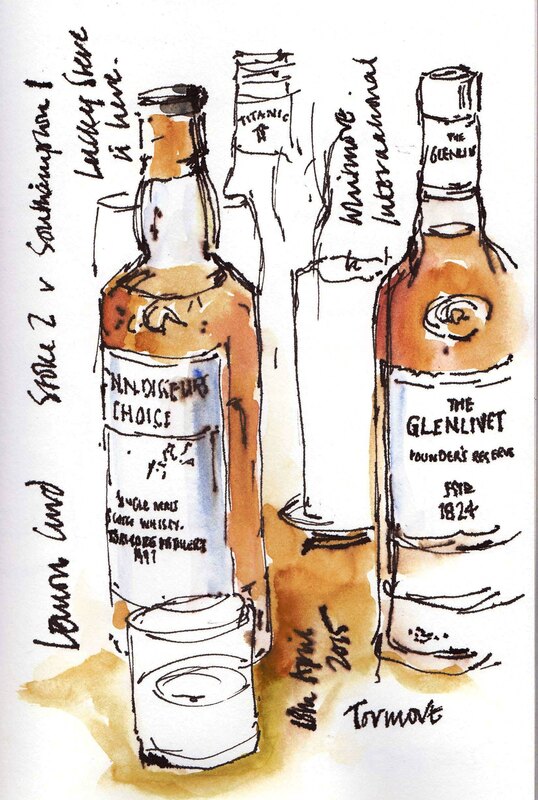 It’s Sketch Book Skool time of year! I have signed up to six weeks of ‘Stretching’ with Jonathan Twingley as our first teacher and it has given me a timely nudge to loosen up away from my formal architectural drawings. So, as a change from streets, here are a few pages from my sketchbook made over the weekend. 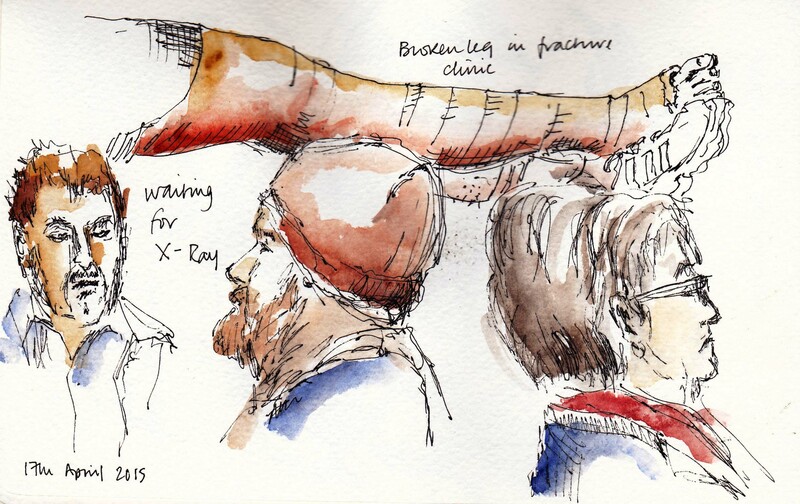 Starting with a long wait in the fracture clinic and a great excuse to draw a few faces, I’m pleased to say that all my fractures are well on the mend and I have now been signed off. 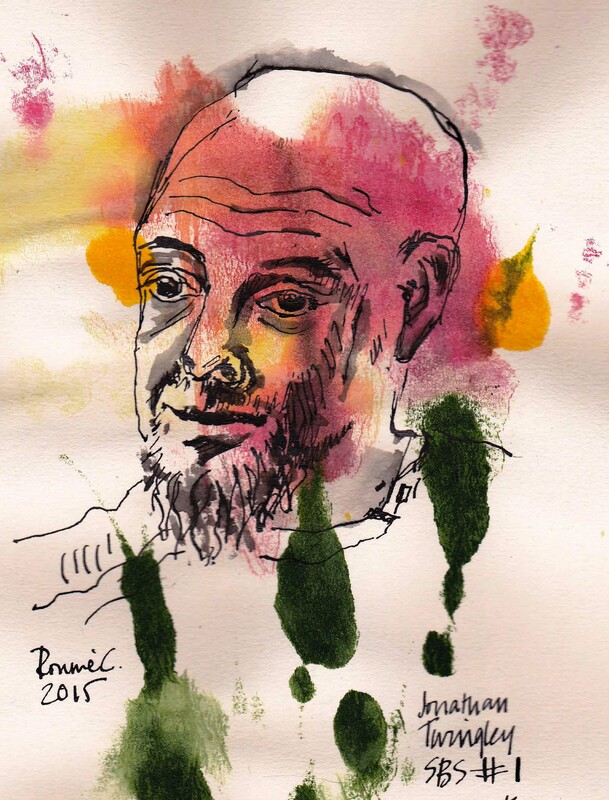 Our first Sketchbook Skool assignment with Jonathan Twingley has been playing around with ink splats – drawing freely in ink and seeing what takes shape. His work is extraordinary and well worth having a look. There were quite a few more of these sketches but this one will do. They got considerably looser. 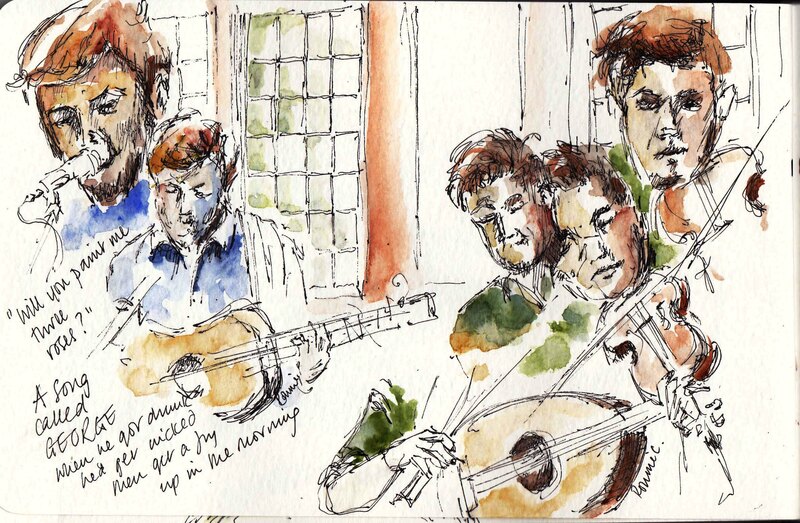 Finally, this great weekend was rounded up by a meal out and a musical treat. 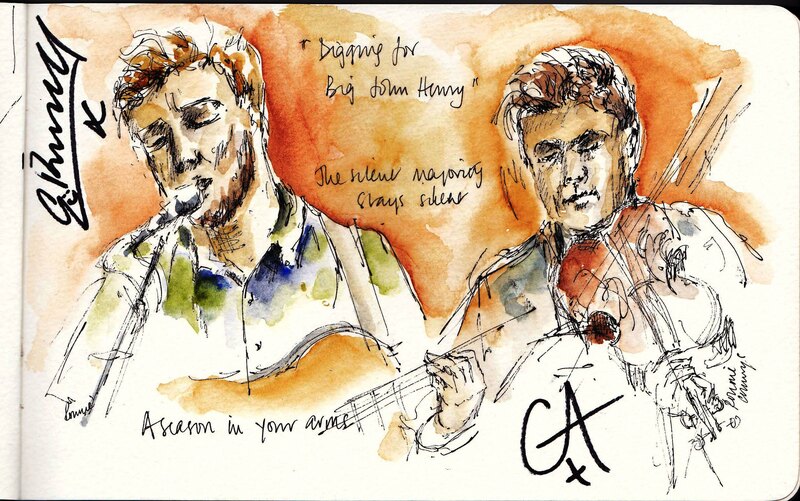 We first listened to Greg Russell and Ciaran Algar play at the 2014 Shrewsbury Folk Festival – they were brilliant! 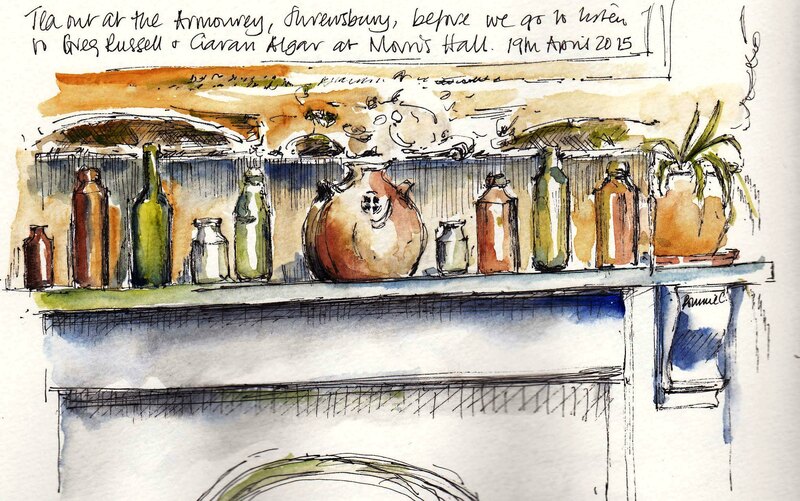 Last night they were playing in Shrewsbury at the Morris Hall. They really are excellent and worth a listen, you can hear some of their tracks through the links on their website. Back to normal with the next post – I have just completed Micklgate, York which will soon appear on the website www.drawingthestreet.co.uk.